Everyone's favorite unicorn wishes you the happiest of holidays in this cheap and super addictive action game. Despite owning all of the consoles, the games we play the most are on the iPhone or iPad, largely because we can pull them out anywhere and enjoy five minutes or even an hour of game time. Case in point, Robot Unicorn Attack. Adult Swim's wildly popular effort made a huge splash on iOS, as we spent too much time guiding the majestic unicorn past obstacles while listening to the enchanting song "Always" by Erasure. Now we have Robot Unicorn Attack Christmas Edition. Although it plays the same, we couldn't resist buying it. In case you've never heard of this series (we can't believe it's a series) before, here's how it works. A unicorn gallops from left to right across the screen, and your job is to keep the animal moving without hitting obstructions or falling off a ledge. You don't necessarily control its speed per se. Instead, there are jump and dash buttons. Dash proves invaluable, since you must charge through objects to survive. The longer the unicorn stays alive, the more points you receive. Then, after losing three lives, the game tallies the score and you can post it to an leaderboard/Facebook. The Christmas Edition follows this basic formula, but with a holiday theme, so the unicorn has a red nose and antlers, and there's a winter themed background. Meanwhile, the song "Christmas Time (Don't Let the Bells End)" by The Darkness plays in the background. The song perfectly fits the Robot Unicorn mythos, but doesn't top "Always". Overall, this is an excellent game that always deserves a play. It's even more polished than Robot Unicorn Attack, as the graphics look significantly sharper. We also love the evil taunts that show up right before the game begins, "You will fail!" being a favorite. That said, we really wish Cartoon Network would have released Christmas Edition as a free upgrade to Robot Unicorn Attack, instead of going for the obvious cash-in. After all, it's nearly the same exact game. Come on. After all, people can play the original online for free, and even that App still costs $1.99. On the flip side, you can download this title for just ninety-nine cents, and it'll give you hours of enjoyment. 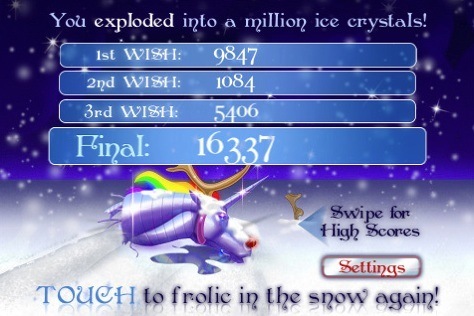 We miss Erasure (it would have been a good idea to include all of the songs and let users switch them), but Robot Unicorn Attack Christmas Edition is a wonderful game that we'll continue to play several months from now. Spend that dollar and make a wish. Requirements: Compatible with iPhone, iPod Touch and iPad. Requires iOS 3.1 of later. What's Hot: Attractive holiday themed graphics, addictive gameplay, only a dollar, great music. What's Not: You can't switch songs, an obvious cash-in on the Robot Unicorn craze.